An extra bit of memory can breathe all new life into your computer, and make heavy tasks like gaming and multi-tasking a breeze. With enough RAM, you won’t need to worry about leaving a couple extra browser tabs open. So why don't you take a look at our guide to the best RAM prices and deals. Even if you're thinking of buying a new Mac, MacBook or pre-built PC over this Black Friday period, you can save even more cash by not adding additional memory at checkout. 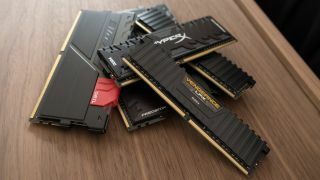 This can work out quite an expensive way to add memory, and instead it’s far cheaper to purchase RAM separately, especially if you can find the best RAM deals like we have found below. DDR4 RAM is the fastest memory that came on the block just a few years ago. At first, it was prohibitively expensive for anything but the most extreme gaming PCs, but now you can find it in many mainstream laptops or desktops. The Corsair Vengeance LPX is among one of the most solidly reliable kits of RAM you can purchase. It’s low-profile form factor makes it an easy fit for most PC builds, and its 2,400MHz starting speed is plenty quick too. MacBooks aren’t the only laptop that you can add extra memory to. As long as they aren’t glued together, like a Surface Laptop, upgrading your RAM is one of the easiest things you can do to improve the performance of your notebook. TimeTic makes relatively inexpensive kits of Hynix IC RAM that could seriously bump up your memory capacity.